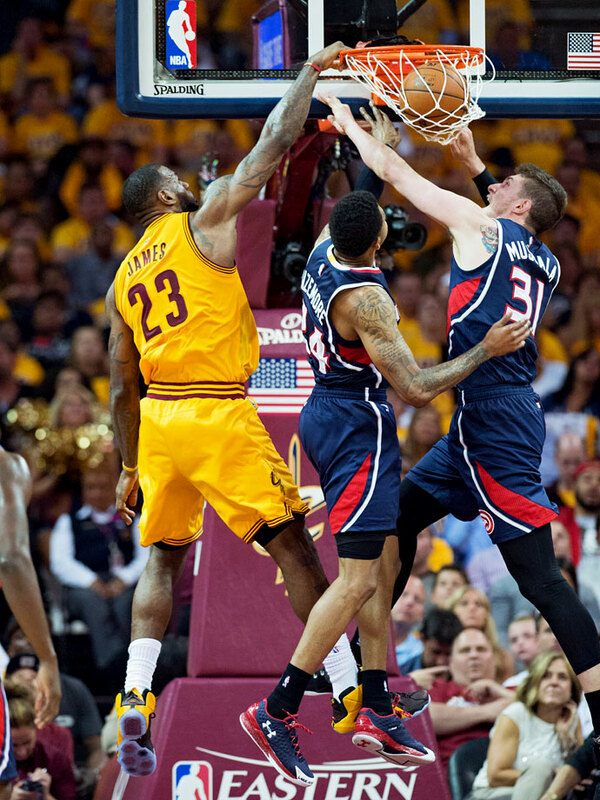 LeBron James and the Cleveland Cavaliers are up 3–0 against the Atlanta Hawks thanks to their record three-point shooting and relentless offensive attack. ​Get all of Jeremy Woo’s columns as soon as they’re published. Download the new Sports Illustrated app (iOS or Android) and personalize your experience by following your favorite teams and SI writers. It was almost a series. Through three quarters, it was a series, and then it wasn’t. It got ugly quickly. Are the Cavs this good? Are the Hawks this far from being up to snuff? It was a bit of both, as Cleveland fought back from a double-digit third-quarter deficit with a 20–3 run and yes, a whole lot of three-pointers paving the way for a 3–0 series lead and a 121–108 win on Friday. No NBA team has come back from down 3–0, the Hawks have never beaten the Cavaliers in 11 playoff meetings and neither of those things feels all that likely to change. Certainly not when Cleveland can win rebound battles 55–28, collect 18 of those boards on offense and hit 21 threes at a plus-50% clip—a total that would have been a playoff record had the Cavs not broken it already in Game 2, in which they buried 25 longballs. Friday brought a much trickier contest and a redoubled Hawks effort, but, as we’re learning, the Cavaliers’ best moments can wipe a messy slate all the way clean. Atlanta had to tinker, and tried. Kyle Korver, who had been a non-factor in the first two games, was effectively repurposed off the bench for 18 points. Al Horford finally looked like a go-to guy, establishing himself early and abusing Kevin Love in the post, and on one particularly brutal dunk. As good as he was, the Hawks were outscored by 26 points with him on the floor. Jeff Teague made 14 consecutive assists without a turnover. They made a team playoff-record 16 threes. Somehow, that still wasn’t the recipe. 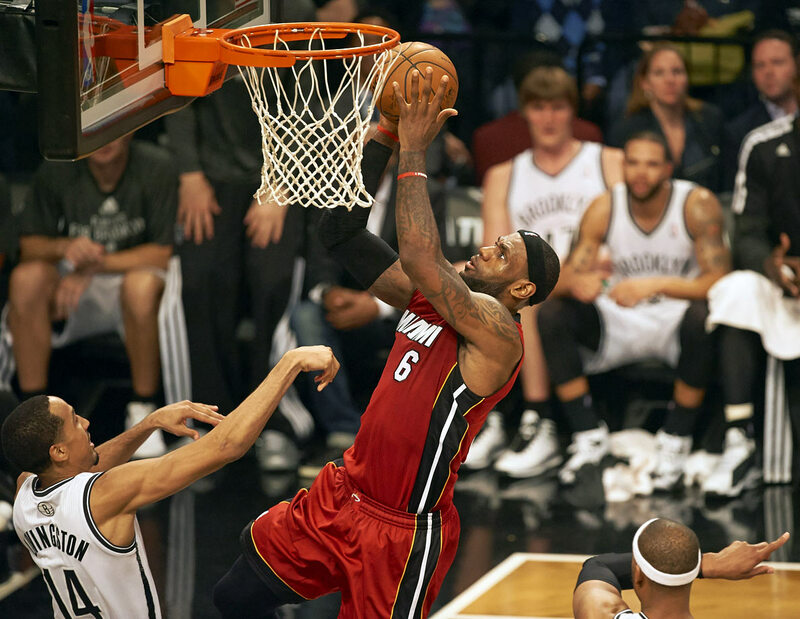 • MORE NBA: Roundtable: Is LeBron the best player to build around? When LeBron James, Kyrie Irving and Kevin Love are all having 20-point nights, it’s hard to win. When Channing Frye dusts himself off for 27 points on seven threes at the same time, forget about it. As discombobulated as the Cavs were at times, even with their opponents flipping turnovers into transition baskets, when they bury the longball, things can end in a few minutes. If you hedge on the three, there’s James, barreling to the rim and opening those shots up anyway. Hammer found nail down the stretch. There went the series. LeBron James missed his first 10 shots but finished with 37 points, 18 rebounds and 13 assists in Cleveland's overtime victory over Atlanta. James, who favored his right leg for most of the fourth quarter and OT, hit a three-pointer with 36.4 seconds left to put the Cavs ahead by one, and the superstar dropped a runner with 12.8 left to make it 114-111. LeBron James matched his career playoff high and set a Miami franchise record with 49 points as the Heat held off the Nets 102-96 to take a 3-1 series lead. 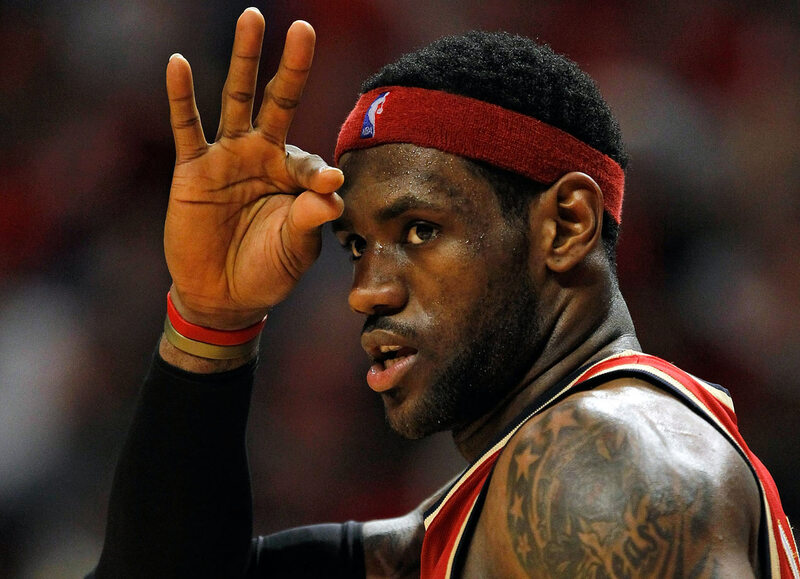 LeBron made 16-of-24 from the field and 14-of-19 from the free throw line in 43 minutes. 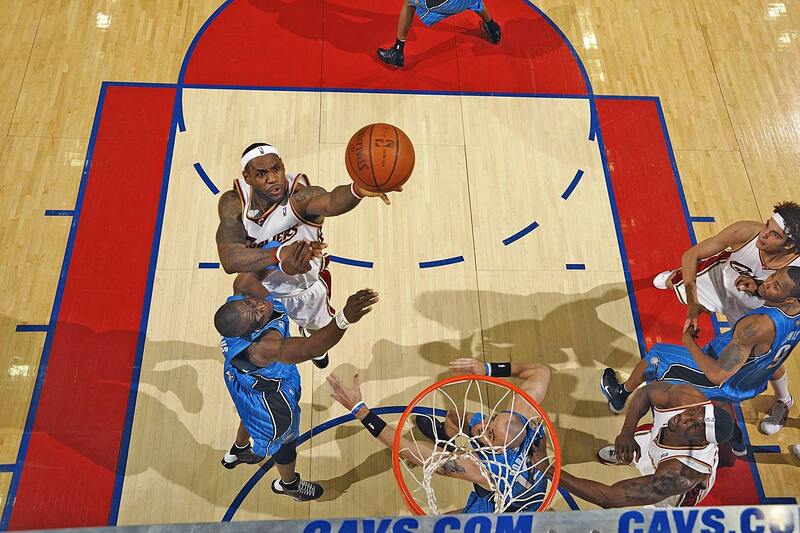 He previously scored 49 points for Cleveland in a 2009 postseason game against Orlando. With the Heat facing elimination, LeBron James shook off a slow first half to score 16 fourth-quarter points, including a key three-pointer with 20 seconds remaining in regulation. He finished with his second triple-double of the 2013 Finals, tallying 32 points (on 11-for-26 shooting), 11 assists and 10 rebounds in the Heat's 103-100 OT victory over the Spurs. LeBron James capped off a triple-double (30 points, 10 assists, 10 rebounds) with a buzzer-beating, game-winning layup in overtime of Miami's 103-102 win over Indiana. James was the first player in NBA playoff history to record a triple-double and buzzer-beating game-winner in the same game. 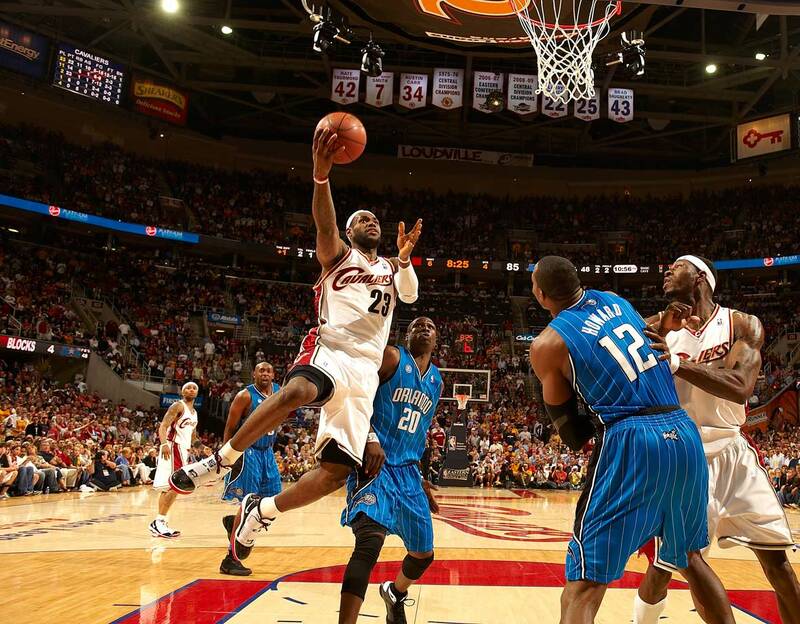 LeBron James was heavily criticized for his play in Miami's Finals loss to Dallas in 2011, but it was hard to quibble with his performance a year later against Oklahoma City. 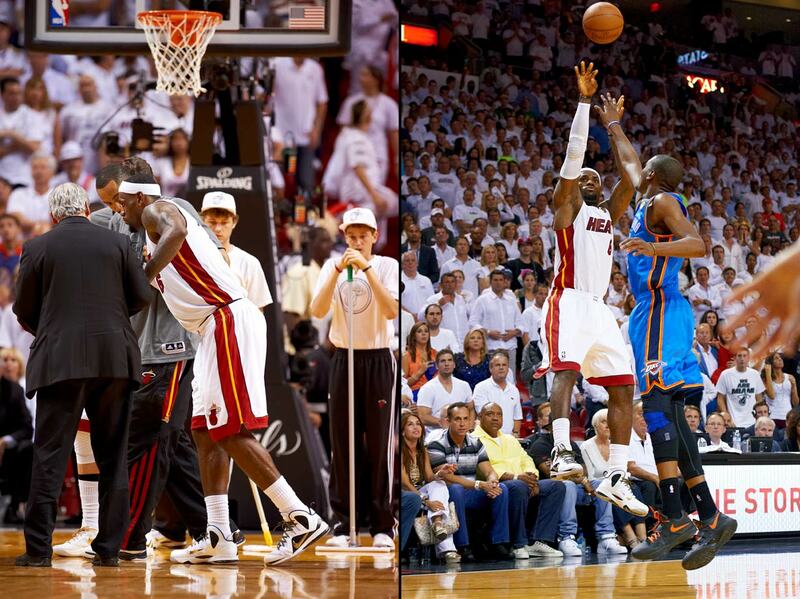 Exhibit A was Game 4. Just minutes after leaving the game with leg cramps, James returned to nail a go-ahead three-pointer with 2:50 left as the Heat defeated the Thunder 104-98. LeBron finished with 26 points, nine rebounds and 12 assists for the Heat, who took a 3-1 series lead en route to winning James' first championship two nights later. 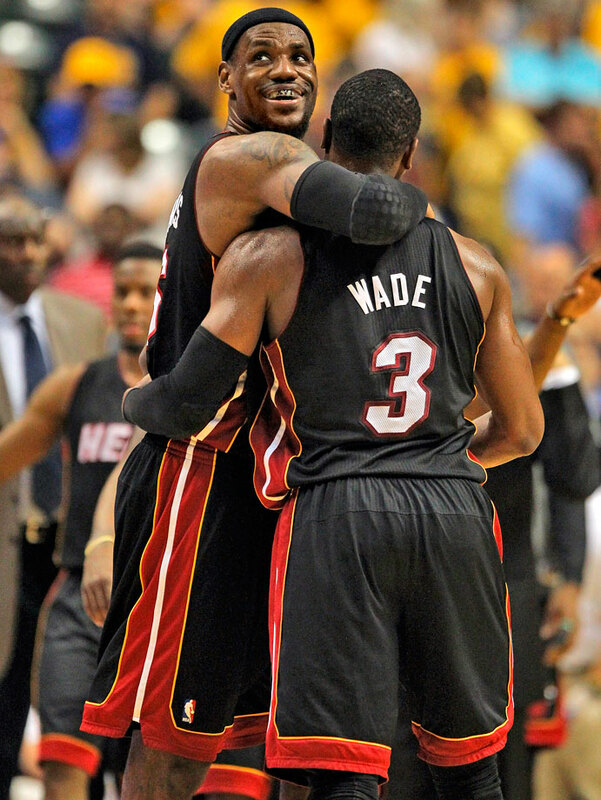 With the Heat facing elimination, LeBron James erupted for 45 points, 15 rebounds and five assists in a 98-79 victory. James joined Wilt Chamberlain as the only players to post a 45-15-5 line in a playoff game, according to the Elias Sports Bureau. Even more impressive, he made 19-of-26 shots from the field, including 12 in a row after missing his first attempt. 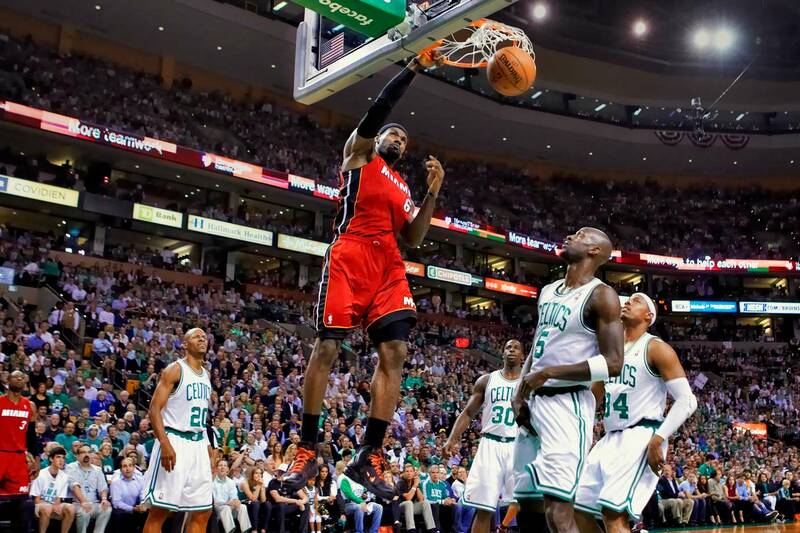 Miami trailed 2-1 in the series and got off to an awful start in Game 4. But LeBron James responded with an all-around gem that included 40 points, 18 rebounds and nine assists as he teamed up with Dwyane Wade to spark a 101-93 victory, with the two stars scoring 38 consecutive Miami points at one stage. 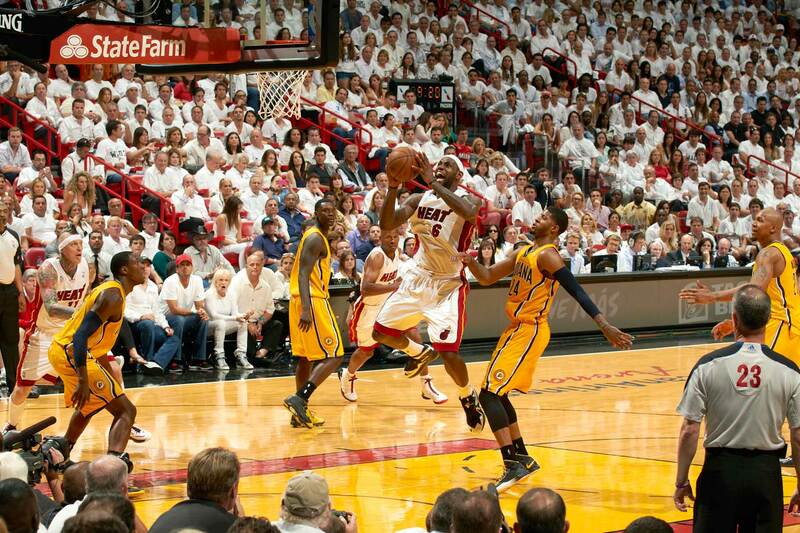 The Heat won the next two games, too, to close out the upstart Pacers. Fresh off 40- and 39-point performances against Chicago, LeBron James kept up his torrid pace by going for 37 points while adding 12 rebounds and 11 assists for his fifth career triple-double. 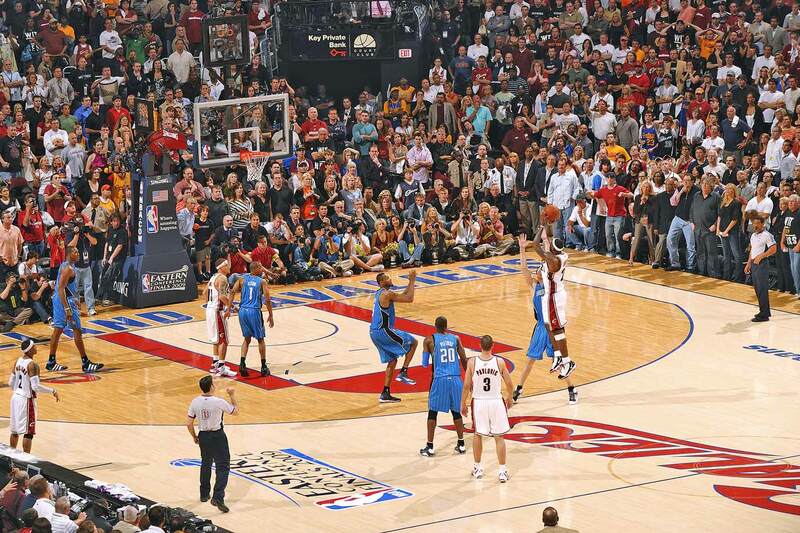 Perhaps most notable: LeBron, not known for his deep shooting, nailed six three-pointers in Cleveland's 121-98 rout. LeBron James had a series of spectacular performances in this series, the last being a 37-point, 14-rebound, 12-assist outing that kept Cleveland alive (the Cavaliers, though, would be eliminated in Game 6 at Orlando as LeBron struggled). LeBron scored 17 points in the fourth quarter, which started with the Cavs trailing by a point and ended with their pulling away for a 112-102 victory. 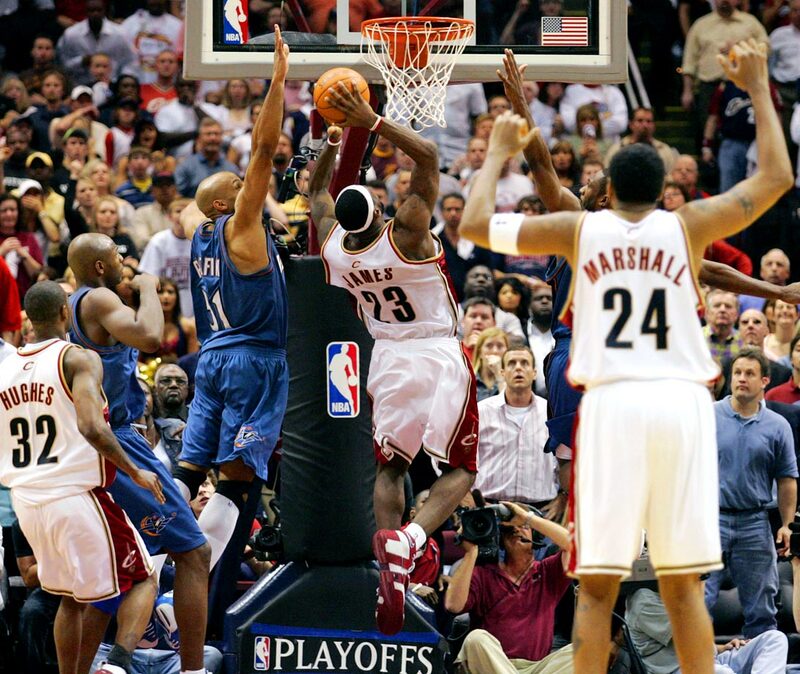 This game will be remembered for having the signature shot of LeBron James' career: a buzzer-beating, game-winning three-pointer to punctuate his 35-point effort and even the series at 1-1 as the Cavs defeated the Magic 96-95. Before his Game 2 buzzer-beater, LeBron James opened the series by setting a franchise record with 49 points (on 20-of-30 shooting from the field). But Orlando rallied from a 15-point halftime deficit to win 107-106. 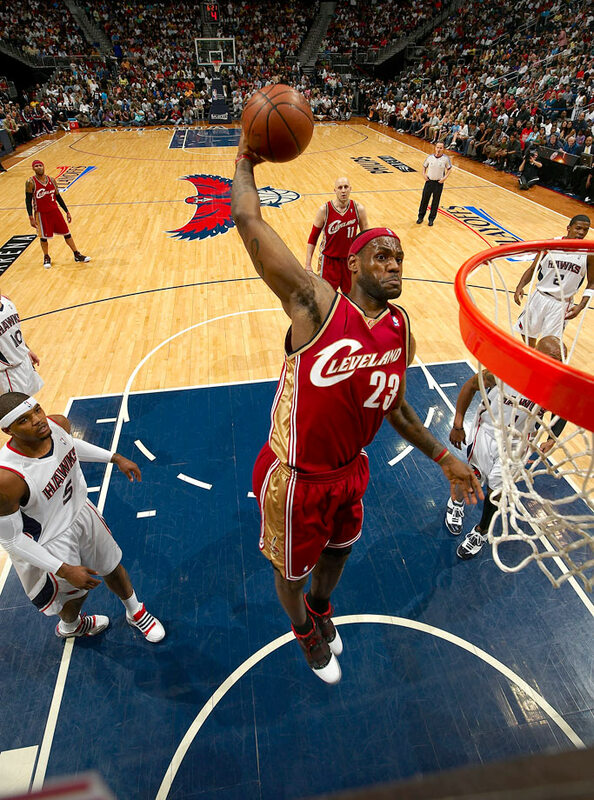 Hawks forward Josh Smith described LeBron James as being "out of his mind." That was a fitting summation of LeBron's performance: 47 points and 15-of-25 shooting from the field, along with 12 rebounds, eight assists and only one turnover in Cleveland's 97-92 win enroute to sweeping Atlanta. 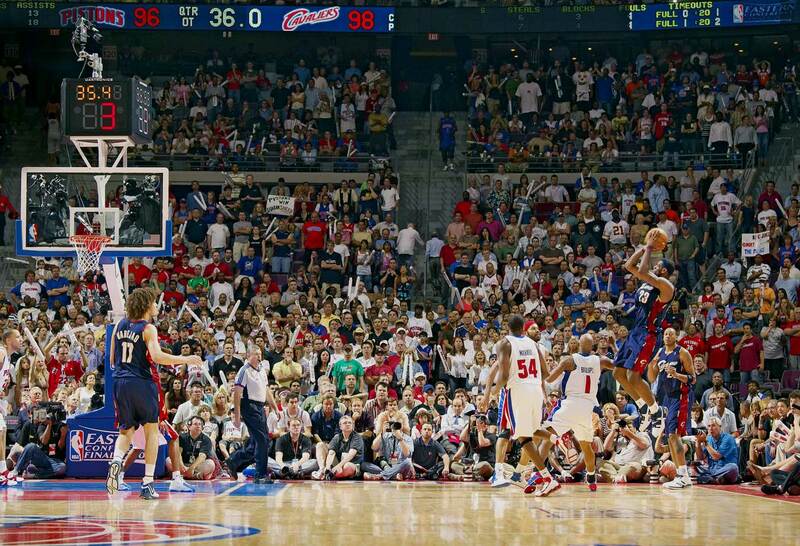 LeBron James scored 45 points and Paul Pierce countered with 41 in a memorable Game 7 duel. 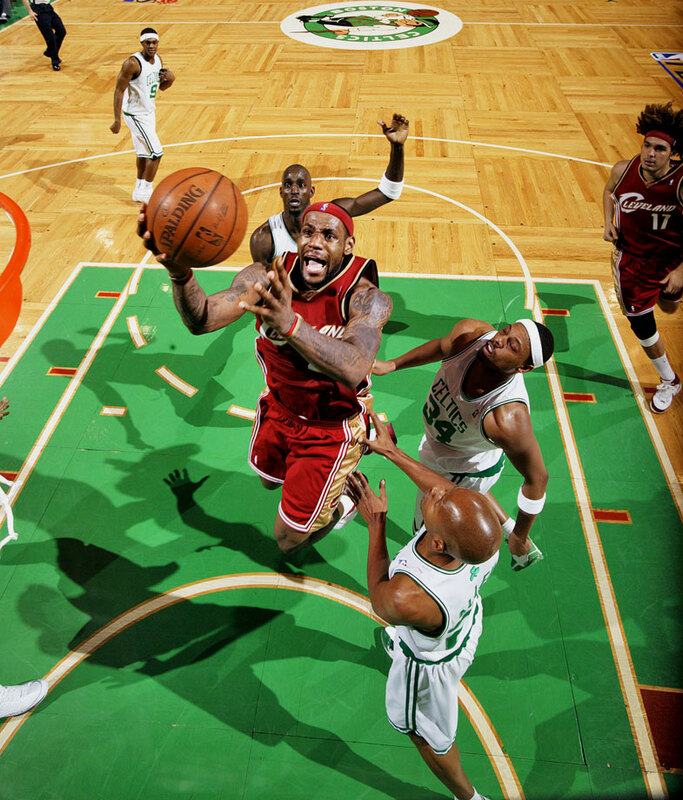 Pierce's Celtics edged James' Cavaliers 97-82. LeBron James famously scored Cleveland's last 25 points (and 48 overall) in a 109-107 double-overtime victory over Detroit. The Cavaliers also won Game 6 to reach the NBA Finals for the first time in franchise history and become the third team to overcome a 2-0 deficit in the conference finals. LeBron James' game-winning, last-second layup lifted the Cavaliers to a 121-120 overtime victory over the Wizards, gave them a 3-2 series lead and capped a performance in which he finished with 45 points, seven rebounds and six assists. Defending that type of talent, employing that style of play for 48 minutes is a brutal task for any team, never mind the East’s top regular-season defense. The Hawks earned the 63–55 halftime lead, closing on a 20–5 run. They were up by 11 at one point in the third. But the Cavs chucked away, undaunted, mostly sharing the basketball and eventually thundering back to flip the script. It’s odd to have such a small margin for error against a team that can be so mistake-prone in itself; credit Cleveland for finding the poise it has sometimes lacked. It may not be this good the rest of the way, but the greater gains might be the difference. After a season of sporadic iso-balling, off-court turmoil and very public soul-searching, the Cavs have settled in a (three-point) happy place heading into Sunday’s Game 4. It’s bad news for the rest of the East, and a warning shot to whomever makes it through the other side of the bracket.